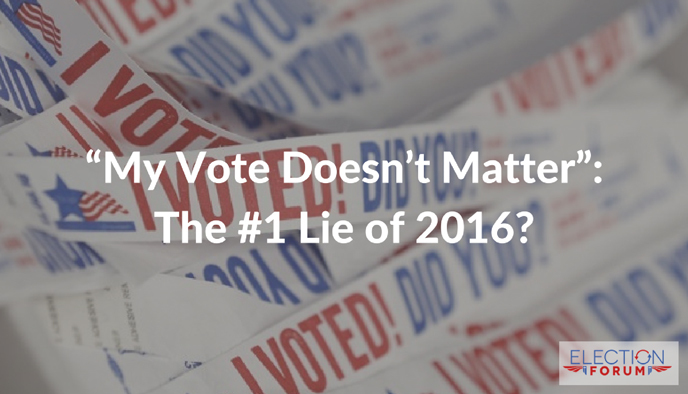 “My Vote Doesn’t Matter”: The #1 Lie of 2016? You help evil triumph by not voting. Christians should vote on Christian worldview issues, and Christians should be influencing elections. To do nothing is just as morally bad as doing something evil. In fact, we are blessed when we take a stand for Christ! This election season has been one of the most wild and unpredictable in recent memory. Traditionally blue and red states have shown recent polling that they could swing the other way. Michigan and Minnesota—blue (or Democratic) states which have not gone for a Republican since 1988 and 1972 respectively—are now a dead heat. Donald Trump is campaigning in Michigan. Mike Pence is campaigning in Minnesota. Georgia and Texas, reliably red states for decades, are now incredibly close. Hillary Clinton has been buying ads in these states. In 2012, the difference of 350,000 votes in four key swing states gave President Obama the election. Let’s not forget Virginia’s US Senate race in 2014. The US Republican nominee ended up within less than 1% of winning the election against the Democratic incumbent, despite months of polling which showed the Republican losing by double-digit margins. That same year, in my state assembly district here in Southern California, the Democratic incumbent lost … by only 706 votes! Election 2016 could be a historically close race too. Your vote counts. Reliable trends in key states from the past cannot predict who will win this time. The legislative races are vital to our well-being in Democratic-leaning states like California or Republican-leaning states like Tennessee. Anti-family legislation, like “all-gender” single-use bathrooms. Your vote for state legislators who reflect your Biblical values is essential to stopping Big Government tyranny and the loss of our religious freedoms. The local races, whether bonds or city boards, and the Propositions, can make or break your state for the worse. Take California for example. The once Golden State now has the highest taxes, and an average of 5.5 businesses per week leave the state. That’s an average of 100 jobs leaving the state, too, and leaving young people without prospective employment or a prosperous future. The state’s infrastructure is crumbling, and Sacramento politicians are more interested in listening to the special interests than doing what is in the public interest. Instead of more bonds and spending, we need laws and lawmakers which respect basic priorities and pay for bare necessities. Your vote is very important, not just because of the Presidential election, but for all the other issues down ballot. Now more than ever, you need to vote! If you have any questions on how to vote, just visit my voter guide online (listed according to county). You can watch my FREE! webinars for more information on how to vote on the candidates and those confusion propositions. Check out my National Webinar if you need more information on the Presidential race. Don’t forget to check out then share my California Webinar, in which I cover the Presidential race and all the statewide races in California. Thank you for your service, Craig!